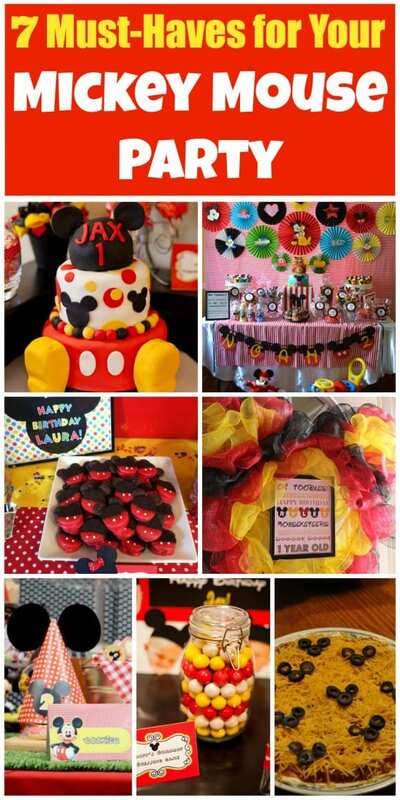 If you're planning a Mickey Mouse party then you really don't want to miss these fun Mickey Mouse party ideas we've rounded up for you from our parties. 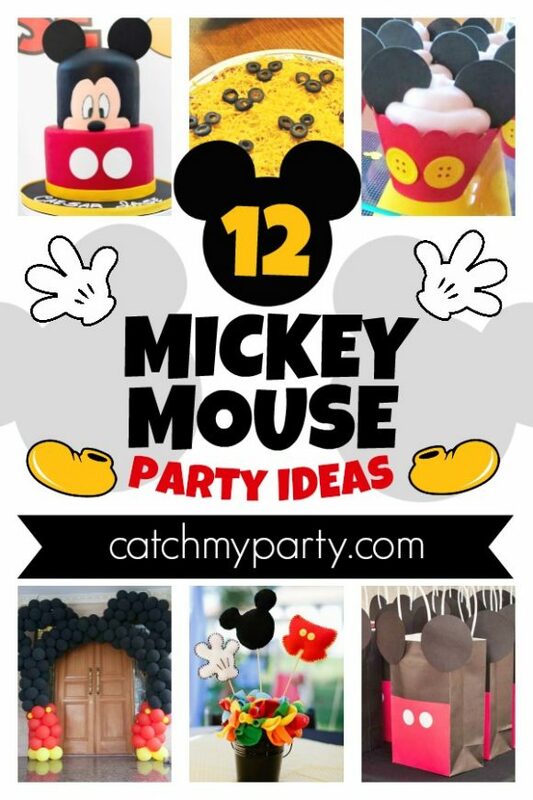 We've included lots of awesome ideas, such as a birthday cake, party food, some Mickey Mouse party decorations, and more! An awesome backdrop really sets the stage and makes your dessert table pop. This red and white striped one covered in bright paper medallions with Disney characters does just that and is a fantastic idea for us to start off with! 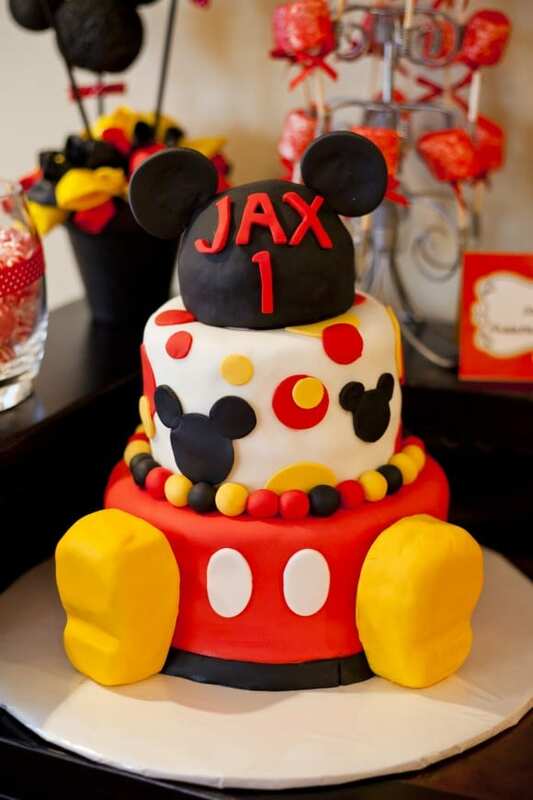 A beautiful Mickey Mouse birthday cake can be the focal point of the dessert table and delight Mickey mouse fans. You've got to love the creativity. 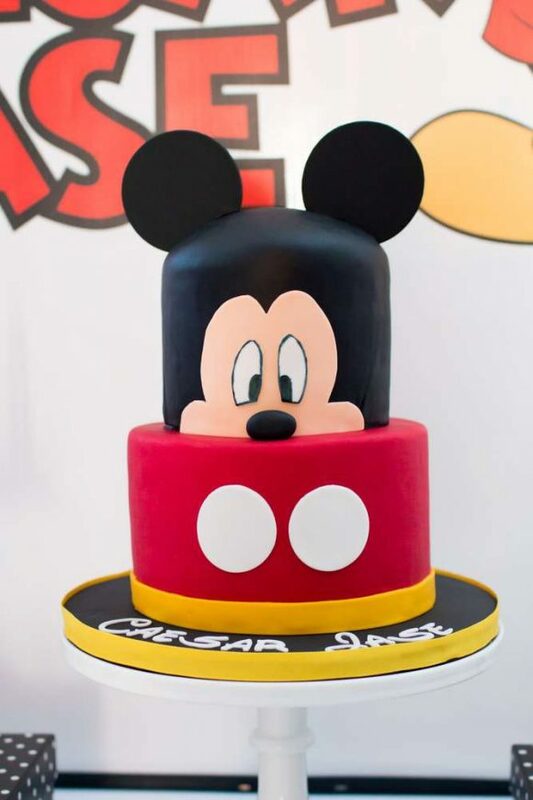 The bottom tier are Mickey's pant and the top tier his head. So cool! 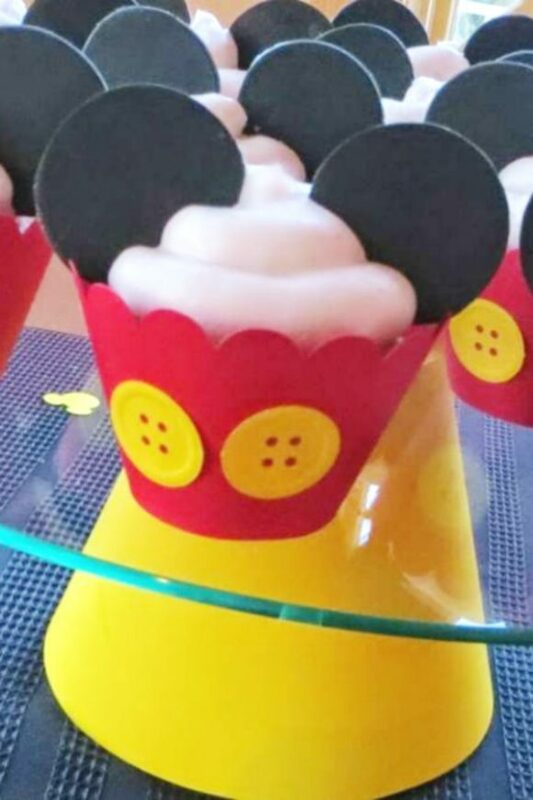 Transform some simple white frosted cupcakes into Mickey Mouse ones by placing them in red wrappers decorated with yellow buttons and topping them with some Oreo Thins as Mickey ears. 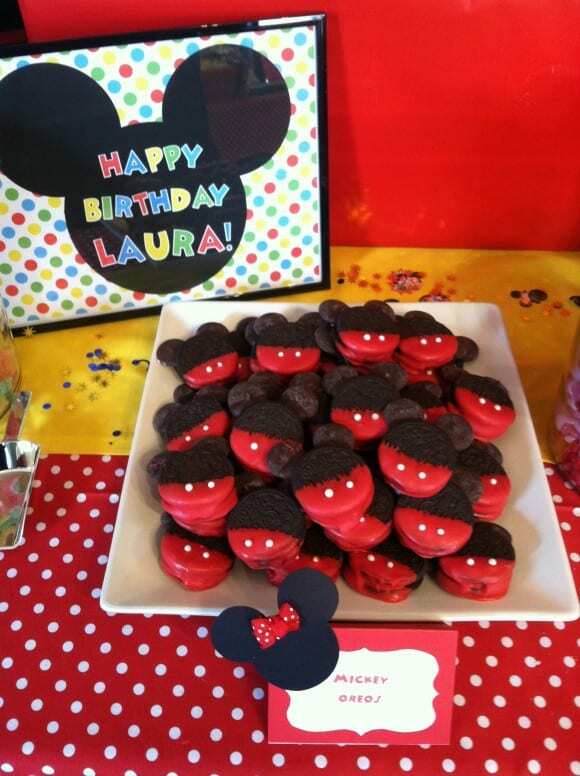 Treat your guests to these fun Mickey cookies. Make your own by dipping a bunch of Oreo cookies, half way through, in some melted red candy melts and add 2 white dots for some Mickey Mouse pants. For the ears slide in some chocolate buttons into the top half of the Oreo and you're good to go! 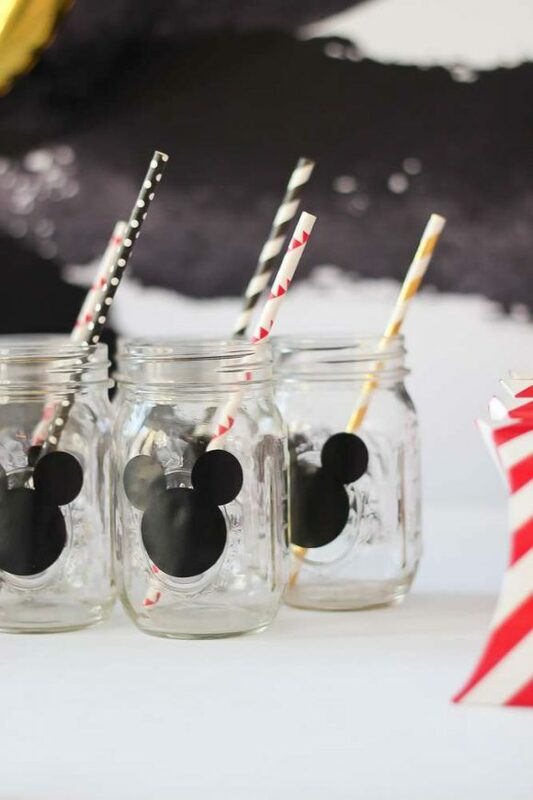 Serve drinks at your Mickey Mouse party in some cute mason jars decorated with a black Mickey silhouette. Finish them off with some colorful red, white, black and yellow paper straws. 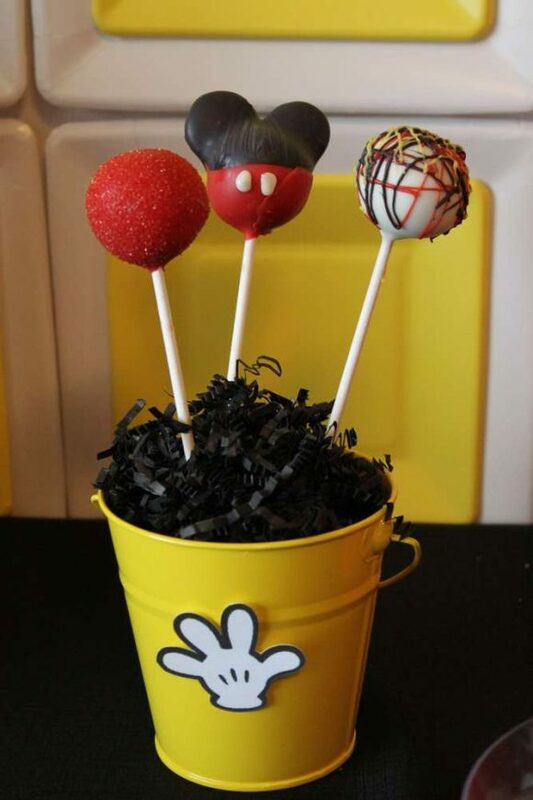 Kids love cake pops and these Mickey Mouse inspired ones are awesome!! They look tricky to make but you can buy your own here. 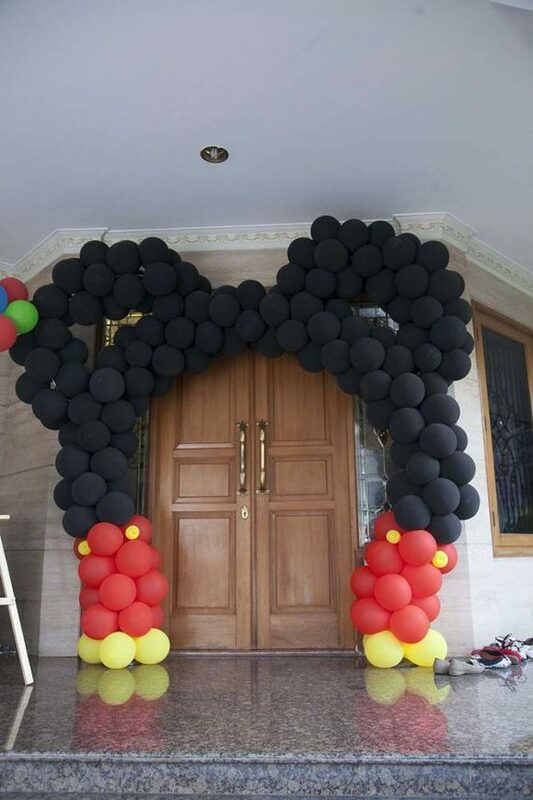 Welcome your guests to your party with an awesome Mickey Mouse balloon wreath! It's the perfect Mickey Mouse party decoration for your party. 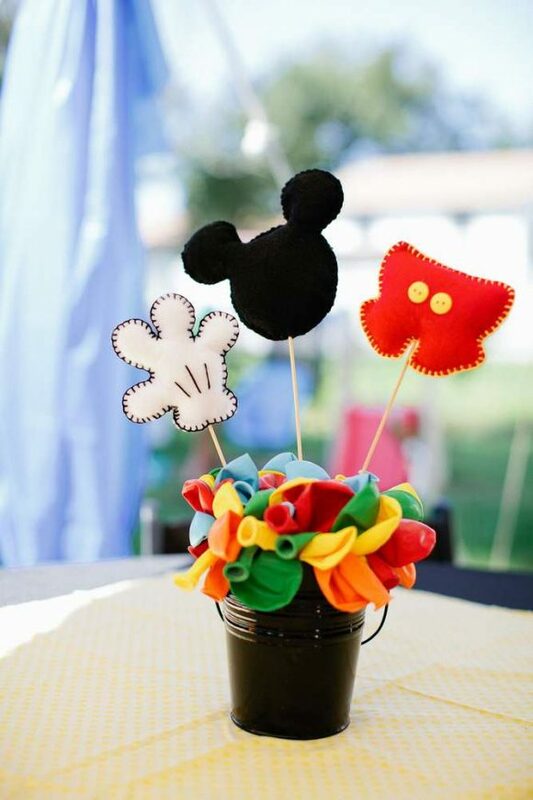 You are going to love this Mickey Mouse centerpiece made of felt ornaments. 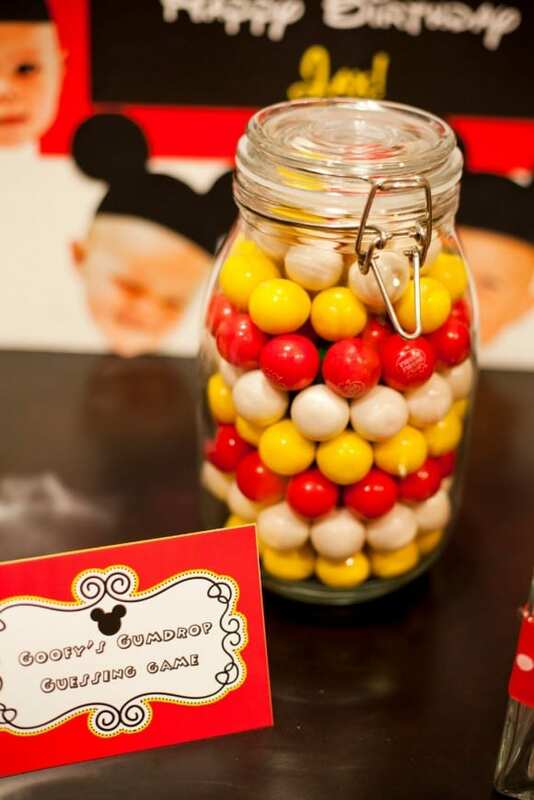 Place them in a vase filled with deflated colorful balloons and you've got yourself a cool Mickey Mouse centerpiece! Kids love pizza and it's a great party food. 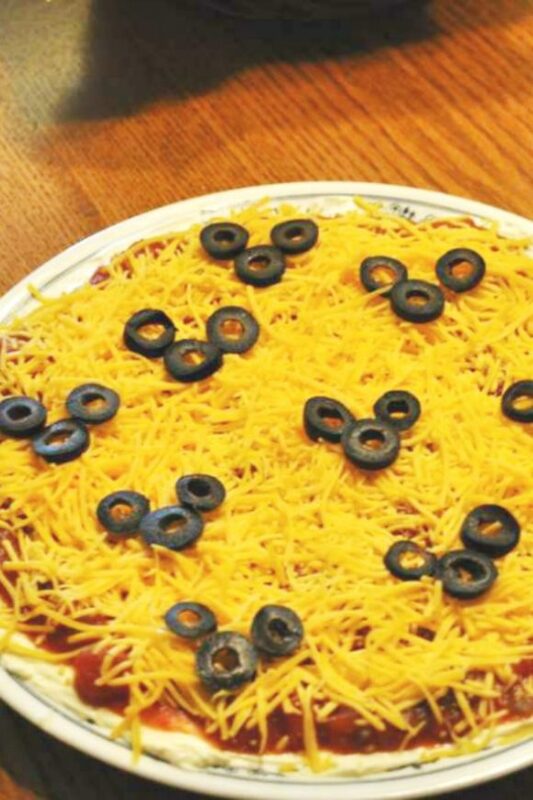 Treat your guests to a Mickey Mouse inspired one with black sliced olives placed to look like Mickey ears on top. So easy!! 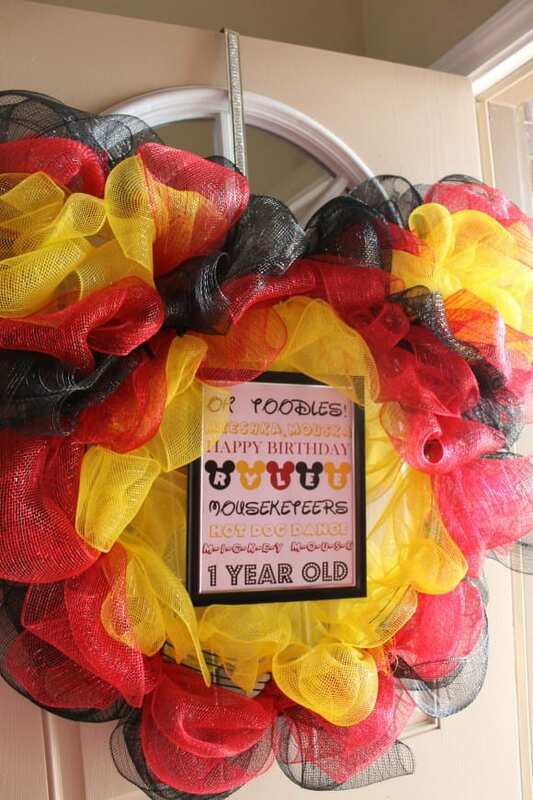 A pretty wreath in red, yellow and black is also a fantastic way to welcome your guests to the party. You can find a bunch of great ones here. Transform simple party hats by adding some black card stock mouse ears. They are so simple to make and are so much fun for kids to wear at your party! 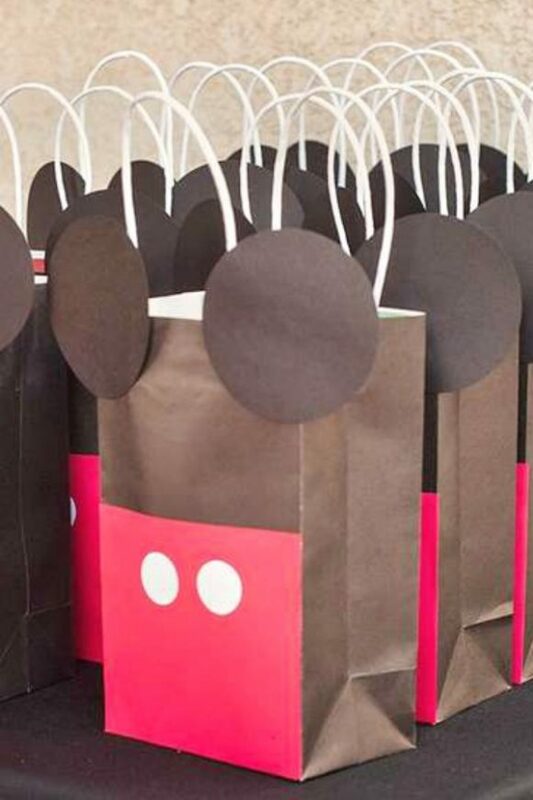 Send your guests home with a fun Mickey Mouse party favor bag like this one full of wonderful goodies! 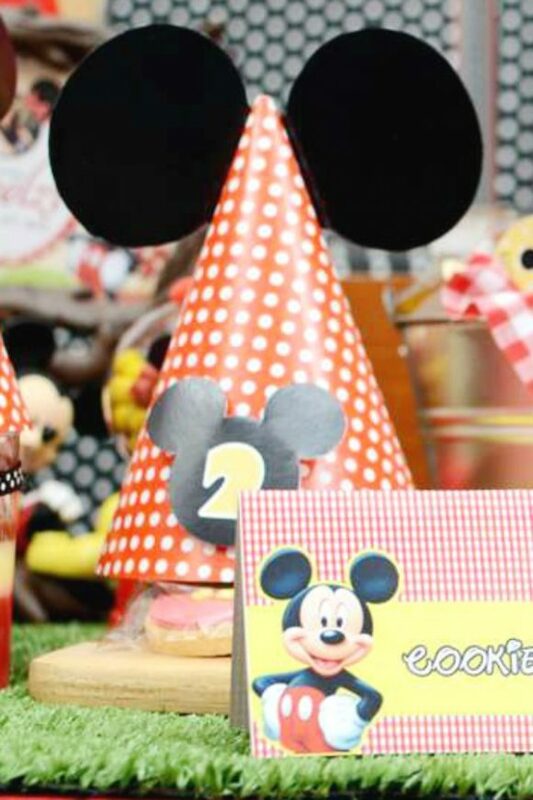 Need more Mickey and Minnie party ideas? Need more Mickey and Minnie party printables? 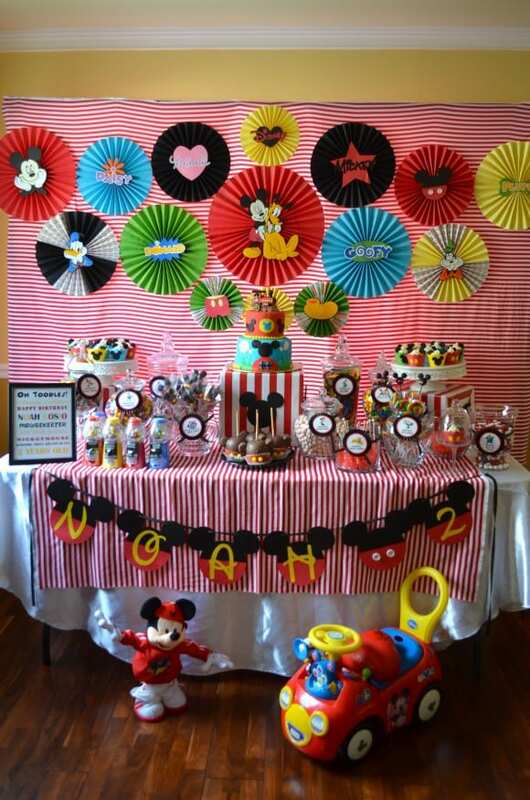 For more inspiration, check out all the stunning Mickey Mouse party ideas on our site, and check out these Mickey Mouse party supplies from vendors with listings on Catch My Party!